On a sunny +1 C mid-winter Saturday, when the Helsinki metro was having a two-day maintenance break, I walked via Mustikkamaa to Helsinki city center. 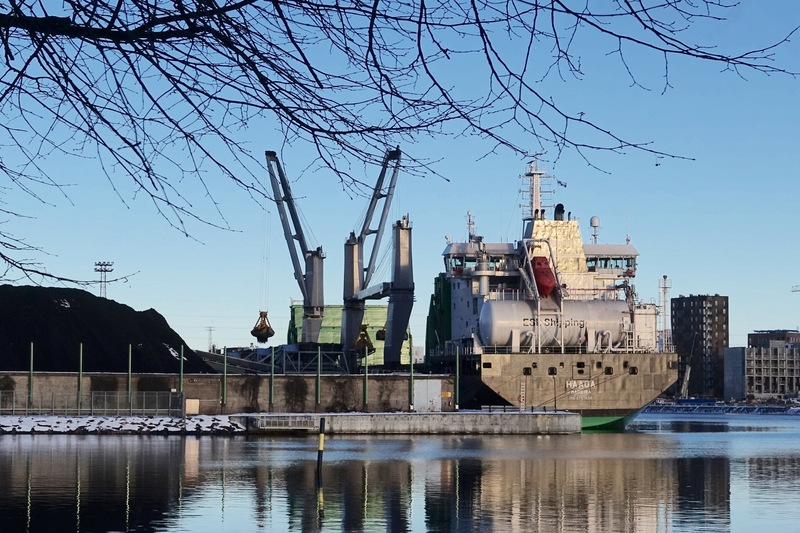 While passing the Sompasaari area with its 45 year old Hanasaari power plant, I noticed that there was a cargo ship moored at its general berth (I learned new English words while writing this piece), its cranes slowly transporting coal from the ship on land. It was M/S Haaga, owned by ELS Shipping, a subsidiary of ASPO plc. ASPO is a four-legged conglomerate with an interesting selection of branches: chemicals, shipping, electronic solutions especially for mobile work, and bakery technologies. The acronym ASPO comes from the Finnish Asunto-osakeyhtiöitten Polttoaine Osuuskunta (Energy coop of housing cooperatives). The company started in the late 1920’s by importing petroleum coke. The past and present fleet of ELS Shipping carries names that sound familiar to Helsinki city dwellers; they are named after the districts of the city. M/S Haaga is a 25,600 dwt self-discharging, ice classed, LNG-powered bulk carrier, launched in Nanjing, China on 20th October 2018. The port of registry is Madeira, Portugal, mainly due to its tax benefits I understand. From China, M/S Haaga arrived to the Baltic Sea through the Northeast Passage (article in Finnish), after having first sailed to Japan for a cargo of raw materials. Based on information at Marine Traffic and Vessel Tracker, M/S Haaga has been criss-crossing the Baltic region since mid-November 2018. To fill its tanks with liquefied natural gas (LNG), the ship sails to Oxelösund, Sweden. For coal, M/S Haaga heads South-East. As of 2005, the population of Ust-Luga does not exceed 2,000, but the port administration expects it to grow to 34,000 by 2025. This would make Ust-Luga the first new town built in Russia after the fall of the Soviet Union. Russia’s main coal basins contain coals ranging from Carboniferous to Jurassic in age. Most hard coal reserves are in numerous coalfields in European and central Asian Russia, particularly in the Kuznetsk and Pechora basins and the Russian sector of the Dontesk basin. 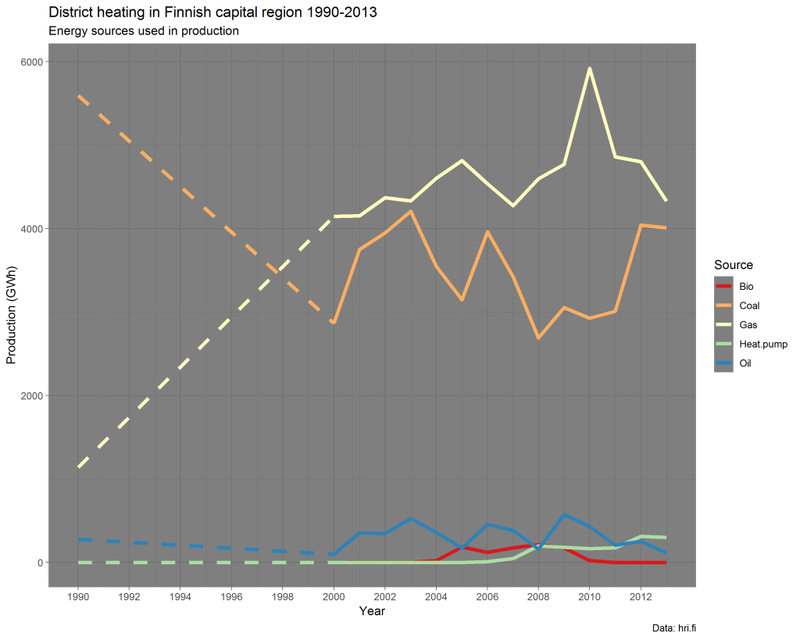 The Helsinki area still depends a lot on coal, especially in district heating. However, the aim is to become carbon neutral by 2035. The dashed line denotes the fact that there are no data points between 1990 and 2000. R code. Our 4-family housing company is one of the customers of district heating of HELEN, the energy company owned by the city of Helsinki. On average, we consume 180 MWh for heating per year. This means a roughly 13,000 Euro bill. As heat of combustion, hard coal is about 30 MJ/kg. In MWh, 1 tonne of coal is ~8 MWh. Our yearly 180 MWh is thus 180 / 8 = ~22 tonnes. From the 25,600 deadweight tonnage (dwt) of M/S Haaga, that’s less than a 1/1000. Where is Haaga now? After a one week stay in Helsinki, it is now back to Russia, this time in St. Petersburg. This entry was posted in Uncategorized and tagged coal, energy, R on January 20, 2019 by Tuija.